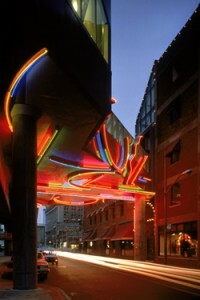 A stunning, colorful series of neon designs adds a sense of excitement and festivity to Detroit’s most active nighttime entertainment district. Free-form neon tubing stretches across the sides and windows of the station, then arches across the guideway, with sculptural raceways adding a feeling of motion to this innovative art form. Funded By: Hudson’s Turner Construction Company, Federal Mogul, City of Detroit, Detroit People Mover Art Commission.